I had a breakthrough on the opening scene in RDR#9. It’s sooo much better, the timeline fits, and I won’t lose the two chapters already written–they’ll slot in later in the book perfectly! So that’s a win. I’m facing the big battle scene in MONTANNA MOON and Iffy just doesn’t want to get our keyboard bloody. I’ll be working on that today. I didn’t watch that dumb award show last night. I don’t appreciate politics creeping into my entertainment–whether it’s TV, movies, sports, or my reading. That’s all I’ll say on the matter. LIVE PD is live, LUCIFER is staying interesting, and I’m vegging to spring training baseball games. The Cards reassigned 7 players over the weekend to the minor league camp that starts today. Fans will start to see more of the regulars now. I ❤ baseball. I finally latched onto a series that's keeping my attention. I've already read Kristen Ashley's Mystery Man series (back in 2015) but at least it's keeping my attention. The heroes are totally NOT PC, ie. they are totally ALPHA. While I would probably suffocate any one of them in their sleep in real life, I can't help loving them more than a little in fiction. I have my own alpha male and I wouldn't change him for the world. He's just not as bossy as the four mystery men. I'm on MOTORCYCLE MAN now and I'm not sure if I'll dive into a reread of the Chaos MC series next. There's a new novella out in Chaos so I just might do a reread, culminating with the new installment. We'll see. Anne Bishop's LAKE SILENCE, first book in a spin-off series in her Others world releases tomorrow. I'm #6 on one copy of the audiobook from the library and I can't decide whether to just pull the trigger and use an Audible credit to grab it or not. Decisions, decisions. Insomnia and some health things (nothing serious just uncomfortable) hit over the weekend, which is part of my excuse for getting not much done, especially yesterday. It was a gray, moisty-damp day that wasn't cold or warm. It felt a lot like early spring. After only two hours sleep, I gave up and mostly stayed in bed dozing during the baseball games and Northwoods Law reruns. And I'm not exactly hitting the floor running this morning. Ah well. There's a new week. Many words and errands to write and run. What happened in your world last week? Here's hoping we all have a productive week. This entry was posted in Writing Life and tagged books, follow up, Monday, procrastination, reading, Red Dirt Royalty, series, sports, stuff, TV, WIPs, writing. Bookmark the permalink. So sorry to hear you were under the weather. I totally get it. Yay for birthdays and breakthroughs! I didn’t watch the dumb awards show either, but the news is full of it today. :yawnfest: Go Live PD! And baseball! And reading! Errands. Check. Did that. Also spent the morning updating my backmatter, like I talked about on the ol’ blog. And I tweaked Blink’s cover. It now has an indigo wash instead of straight black & white. (Or it will be once Amazon completes the upload.) Took care of some other sundry stuff that’s been on my list. 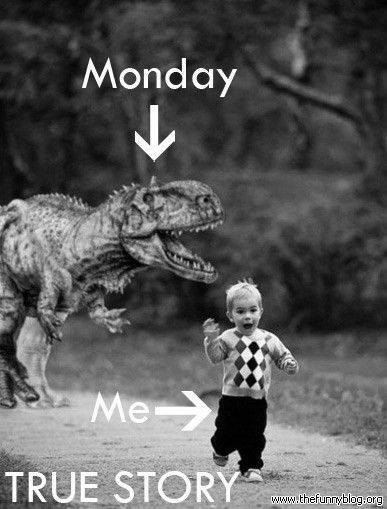 It’s Monday. Yes, I have a case of them. Bleh. I should make myself go outside or something. But I have edits. And I was such a naughty puppy over the weekend, I really should do those today. Guess what? You hit a milestone for me. Your comment was #5000 on the new** blog.